Bertha Jacoby was born August 5, 1918 near Garden City, Kansas to John Jacob and Amalia (Schneider) Schneider. She passed away on September 6, 2018 at Life Care Center in Greeley, CO at the age of 100. Bertha attended school in Holcomb, Kansas. The family moved to Brighton, Colorado where she attended school. On August 29, 1937, Bertha married Henry A. Anderson in Brighton. After their marriage they farmed West of Fort Lupton and later near Ione, moving to the BeeBe Draw area. After moving off the farm they located to Greeley where Bertha worked at the Wright McGill Fish Hook Factory, Kuner Empson Company, Colorado State College (UNC), Weld County General Hospital (NCMC), Greeley School District and the Windsor School District. Henry passed away in June of 1972 in Greeley. 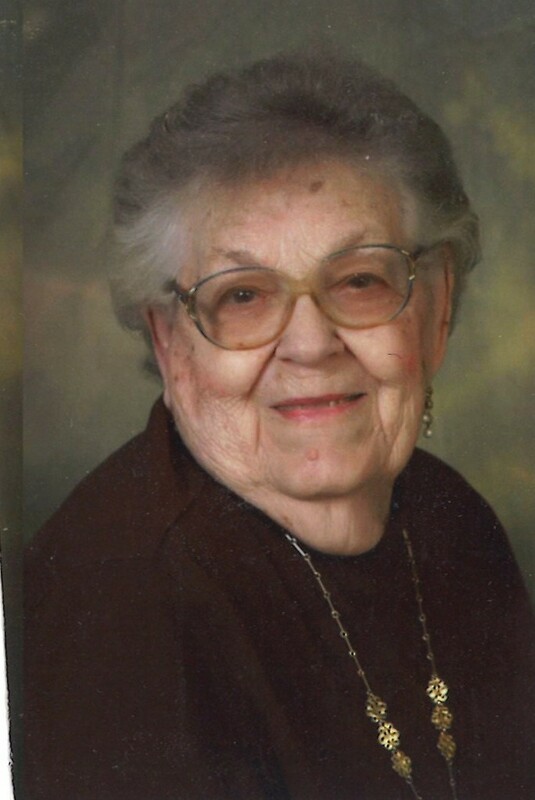 Bertha was a member of Faith United Church of Christ in Windsor for many years. She later married William Jacoby in August 1973 at Faith UCC, Windsor. He passed away in May 2001. Survivors include her son, Myron Anderson of Windsor; daughter, Donna Helzer of Fort Collins; grandson, Dean (Megan) Helzer of Fort Collins; granddaughter, Della (Hector) Acevedo of Aurora; great-grandsons, Brent and Aiden Helzer of Fort Collins and Miguel Acevedo of Aurora; numerous nieces and nephews. She was preceded in death by her sisters and brothers; Katie, Lydia, Marie, Emma, Minnie, Martha, Fred, Jake, Frieda and George, son-in-law Delbert Helzer and daughter-in-law Mary Ann Anderson as well as nieces and nephews. The family would like to thank Life Care for Bertha’s care. Services will be held at 11 a.m. Wednesday, September 12 at the Adamson Chapel with reception to follow. Private interment at Sunset Memorial Gardens. Memorial gifts may be made to “Faith UCC”, “American Heart Association” or “American Cancer Society” in care of Adamson, 2000 47th Ave., Greeley, CO 80634. Friends may leave condolences at AdamsonCares.com. We encourage you to share any memorable photos or stories about Bertha. All tributes placed on and purchased through this memorial website will remain on in perpetuity for future generations.